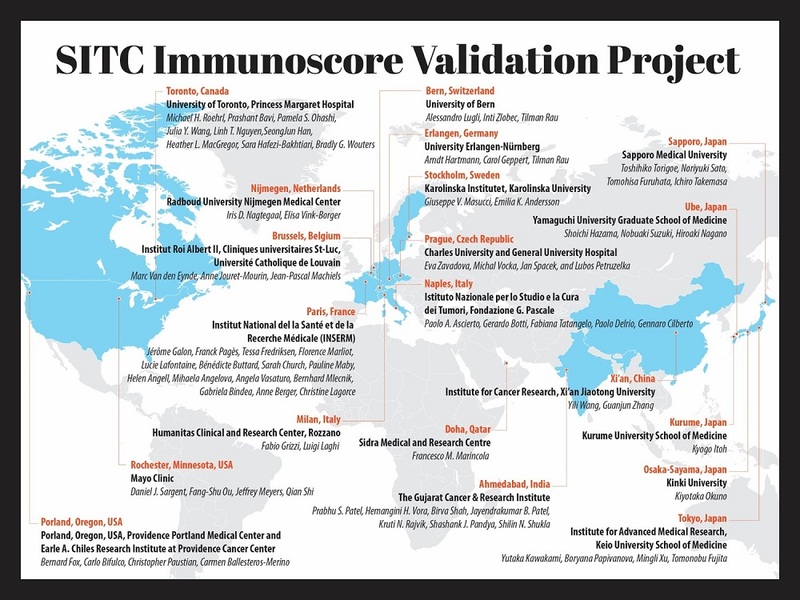 The Society for Immunotherapy of Cancer (SITC) Immunoscore Validation Project is a global, collaborative effort (click here to view map) to introduce immune parameters into tumor classification systems. SITC played a critical role in facilitating communication and data transfer among all of the participating centers in this study (click here to view our process). Organized in collaboration with the European Academy of Tumor Immunology, the Cancer and Inflammation Program, the National Cancer Institute, National Institutes of Health, USA, and La Fondazione Melanoma, Italy. 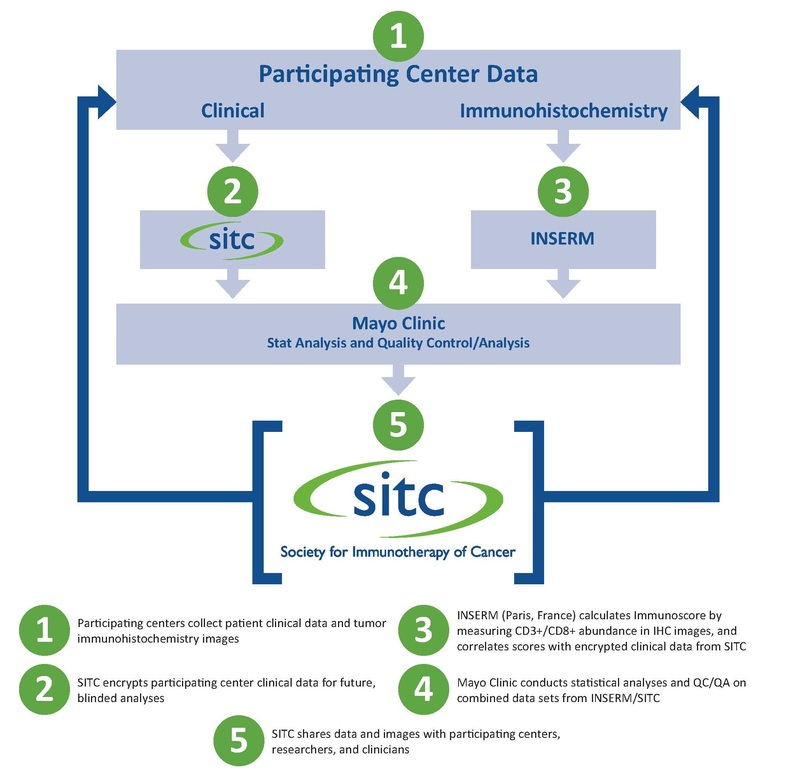 SITC Immunoscore Validation Project publishes findings in The Lancet. Published on May 10, 2018: "International validation of the consensus Immunoscore for the classification of colon cancer: a prognostic and accuracy study” – featuring data from more than 3,500 colon cancer patients from 13 countries – reinforces earlier research suggesting the activity in a patient's immune system helps control cancer progression. Outcome prediction in cancer is usually achieved by evaluating tissue samples obtained during surgical removal of a primary tumor, and focusing on the histopathological characteristics. Tumor staging (AJCC/UICC-TNM classification) is based on tumor burden (T), presence of cancer cells in draining and regional lymph nodes (N), and evidence of metastases (M). However, cancer outcomes can differ significantly between patients whose cancers are at the same stage. The TNM classification provides limited prognostic information in cancer and does not predict response to therapy. Increasingly, data suggest that cancer development is controlled by the host’s immune system, underlying the importance of including immunological biomarkers in the determination of prognosis and response to therapy, a concept that has been termed, “Immunoscore.” Data collected from human cancer tissue samples demonstrate that immune classification has prognostic value and may be a useful supplement to the AJCC/UICC TNM-classification. It is therefore important to begin incorporating immune scoring in determinations of cancer prognosis, and to make sure it becomes a routine part of the diagnostic and prognostic assessment of patients with cancer. Click here to view the study in The Lancet. The latest results from the Immunoscore Validation Project were presented by Dr. Jérôme Galon during the Oral Abstract Session at the 2016 ASCO Annual Meeting in June 2016. To view the SITC press release and updated results, click here. View video and presentation slides from this program here. Participating Centers from across Europe, Asia, and North America met online to explore PathForceDx software functions and to discuss ideas and best practices for sharing slides and data. View abstracts published in JITC. Slide-sharing portal powered by PathForceDX.